MOVIE SYNOPSIS: You can watch Industrial Light & Magic: Creating the Impossible, full movie on FULLTV - Documentary chronicling the 35-year chronicle of the legendary factory of digital effects Industrial Light u0026 Magic, founded by George Lucas in 1975, and has played a major role in many of the most famous Hollywood productions, from the sagas of " Star Wars, "" Indiana Jones, "" Star Trek, "" Pirates of the Caribbean, " " Harry Potter "or " Transformers "to films like " ET the Extra-Terrestrial "or " Avatar ". You are able to watch Industrial Light & Magic: Creating the Impossible online, download or rent it as well on video-on-demand services (Netflix, HBO Now), pay-TV or movie theaters with original audio in English. This film has been premiered in theaters in 2010 (Movies 2010). The official release in theaters may differ from the year of production. Rating: 4/5 by 238 users. The 60-minute film (full movie) was directed by Leslie Iwerks. The original audio of Industrial Light & Magic: Creating the Impossible has dialogues in Dolby Digital. The film was produced in USA. Screenplay written by Jeff Stephenson and Leslie Iwerks. Diana E. Williams, Leslie Iwerks and Jane Kelly Kosek. This film was produced and / or financed by Leslie Iwerks Productions. Original music composed by Christopher Brady. As usual, the director filmed the scenes of this film in HD video (High Definition or 4K) with Dolby Digital audio. Without commercial breaks, the full movie Industrial Light & Magic: Creating the Impossible has a duration of 60 minutes. Possibly, its official trailer stream is on the Internet. You can watch this full movie free with Dolby Digital or English subtitles on movie TV channels, renting the DVD or with VoD services (Video On Demand player, Hulu) and PPV (Pay Per View, Netflix Movies, Amazon Prime Video). 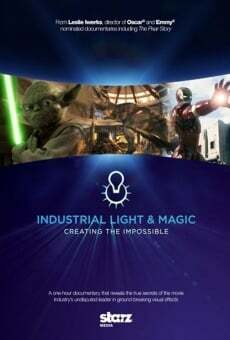 See the page of this full movie, Industrial Light & Magic: Creating the Impossible in FULLTV Movies.